Do you want to change date and time information associated with specific file or folder on the computer? 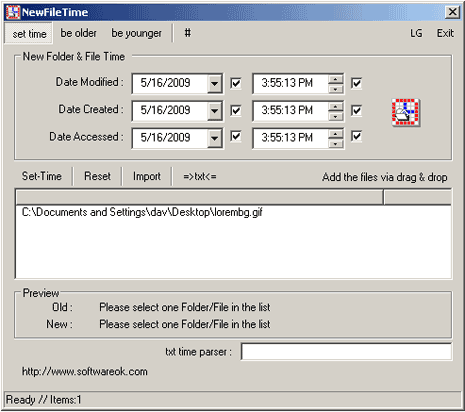 NewFile Time utility allows you to make such changes using very neat and easy to use interface. To get started, just drag and drop any file in the application window (or use import button). This utility will automatically show the date and time information for: last modified, creation info and last accessed. You can change any time or date information manually and hit the Set-Time button to save changes. It also allows you to import information in a text file which can further processed in MS Word or MS Excel. Also, this utility does not require installation – just download NewFile Time [weblink] and double click to start using the application. Handy utility to change date-time information of files and folders on the fly. Whoow, I was looking for a tool to change the modify date of a file, based on the file name. (Don’t ask me why) The tool does it for me! I drag&droped the files and export it to excel. After that I was free to change all of it, and to import it back to NewFileTime just the way I want it. Great work!